Eventually, the family moved out – many states away. Now, American Homeowner Preservation, the mortgage holder, is preparing to list the home for sale. Paranormal investigator John Zaffis featured the 200-year old home on his SyFy reality program Haunted Collector in 2012. What they found is startling. It started with the Haunted Collector team’s discovery of a 19th-century leech jar in a secret compartment in the attic. Doctors of the time kept jars of leeches, to be used in bloodletting. While recording their attempts to communicate with the spirits causing the haunting, Zaffis asked the spirit’s name and heard the name “Jerome” whispered back. A reading from their EMF pulser seemed to confirm some type of activity at the same time that the voice was heard. After some digging through the town’s records, the team unearthed that the house had been owned in the mid-19th century by the reverend James Bennett, whose family resided there for several generations. His son Jerome died at the age of 27 from tuberculosis, a disease that was often treated by placing the afflicted in a separate room from the rest of the family, and bloodletting the patient with leeches. The final dagger? Jerome Bennett, along with most of his family, was buried in Pioneer Cemetery, right next door to the home. With all that evidence, let’s assume that the house is inhabited by the supernatural. While some people might suggest we ignore that detail in marketing the house, we’re going to do the opposite: we’ll candidly point out the home’s troubled history. 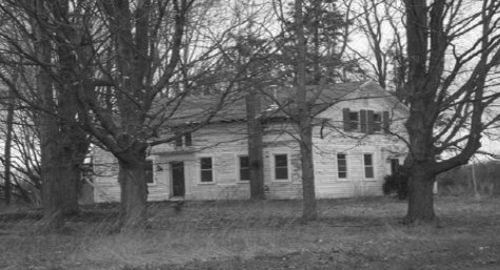 First, a Forestville-area agent, Jon Steiger, pointed out that while New York state’s laws may not require a seller to disclose that a house could be haunted, the weird stories about the home are “readily available to anyone doing a Google search of the property address.” In other words, there’s no hiding it. Second: While there are some cases of homes plummeting in value when ghosts were discovered, there’s also reason to believe that a haunted house might in fact be worth more than an untroubled house. It’s a theory, but here’s the rationale: a haunted house-and especially one next door to a cemetery-is worth more because of its potential to generate income for its owners. Thrill seekers would likely pay a premium to spend the night in a room, or even rent the whole house. A Colorado hotel whose long history of supernatural activity inspired the Stephen King movie “The Shining” offers tours that detail all the creepiness, as well as overnight stays in Room 217, “the most active” place for the building’s spirits. And on airbnb, there’s a page that showcases haunted rentals, everywhere from a small town in New Mexico to a castle in Russia. And around Halloween, when interest in anything spooky spikes, a bona fide haunted house could generate significant income. Americans spend over $7 billion each year on candy, costumes and activities related to Halloween. Teens and young adults, ages 18 to 34, are the most common demographic pursuing Halloween activities, and by one expert estimate, there are more than 1,200 Halloween attractions that charge admission, attended by an average of 8,000 people. An entrepreneurial homeowner could turn the house and the story of Jerome Bennett into a legitimate haunted attraction. There’s nothing ghastly about it. How many people would prefer to get their Halloween dose of spookiness from an authentic “haunted” house – next to a cemetery, no less! – than from a manufactured attraction like a haunted cornfield? Built in 1820, the house was once handsome. The two-story main wing features shuttered windows and a roof supported by heavy trim which likely once capped a pair of Greek Revival-style columns that would have bracketed the front of the house. They’re gone, but traces remain visible, suggesting that the house had a grander appearance in the distant past. A one-story wing projects off the side. The house has suffered severe neglect inside and out which new owners would need to remedy, but “this was once a beautiful home and could be once again,” Steiger, the real estate agent, said. The leech jar was removed from the house, and the Haunted Collector episode ended with the then-owners thanking the show’s host for bringing peace to the house. Nevertheless, the eerie stories linger-regardless of whether the ghosts themselves do. Of course, it’s also possible that someone buys the house simply to rehab and maintain it, and let the Bennett family rest in peace. Whatever the motivation, though, the value of owning a truly haunted house is really all in the buyer’s mind. Some might argue that’s also where the ghosts are.